Here at Visit Cleveleys, we get lots of emails from people on many different subjects, and it’s always lovely to hear from you, especially when you love Cleveleys as much as we do! “Just to say how much we enjoy your webcam – viewing is becoming a daily ritual! We live in a small market town called Kirkby Stephen with a very much different landscape to that of Cleveleys, often shrouded in cloud because of the surrounding fells, but very beautiful. The trouble is it’s not very good for sun worshippers like Alun and I, so most weekends in the summer we go in search of the sun which more often than not can be found at the seaside. In the past we would occasionally go to Blackpool, just about as far as we could go comfortably from where we live for a day out. 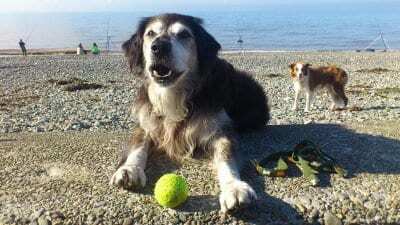 Whilst we appreciate everything that Blackpool has to offer, we prefer the natural beauty of the coastline and the long walks to be had along the beaches and proms, you see we have two dogs who simply love beaches and walking! I’m not sure how we stumbled upon Rossall Promenade at Cleveleys but we’ve never looked back since and enjoyed much of last Summer there, either Saturday or Sunday, clutching our Morrison’s “last forever bag” full of sandwiches and a flask of coffee, not to forget dog leads, water a bowl and of course….poo bags! 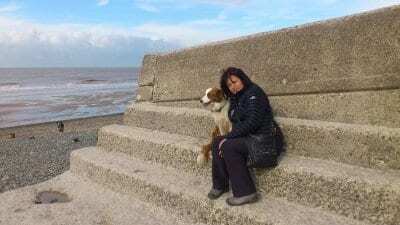 Ruby our brown border collie absolutely loves it at Cleveleys and as we are driving down her head pops up every now and again when the clicky thing goes (car indicator) to see where she is and give her approval – we swear she has Dog Nav. 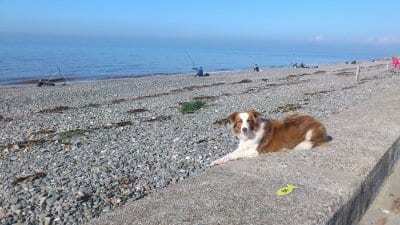 On one occasion on our arrival, she jumped out of the back of the car like a coiled spring and headed like the clappers down the beach squealing with excitement as she went, much to our amazement and that of everyone around us, we watched as she headed for the sea which was miles out, wondering if we would ever see her again. Suddenly she screeched to a holt and looked around in a panic that she was alone and that we hadn’t followed with equal enthusiasm – any way a good day was had by all. We can now look at your webcam before we head off on our travels to see what the weather is like, not that a bit of cloud or rain would deter us. It’s not often that we have to resort to sitting in the car, which is fine, I people watch while hubby reads the paper, me annoyingly nudging him to ask – what do you think their story is then? One lady I watched last year (she seemed to always be there when we were), just wandered up and down the shingle picking up I’m not sure what, as she went. Alun would say just go and ask her – no I said she may not want to tell me !! I think now it may simply be sea glass and not precious stones as I first suspected….or hoped, I even did a bit of research. We are amazed though at the amount of people that do car sit and even have a sleep, with seat pushed back. I just laugh and say – that’ll be you one day. Enough of my ramblings and thank you again for your excellent and informative website. Ruby comes to visit Cleveleys too!